The customer was expanding their operations into a new unit. Armkor were requested to provide their services by refurbishing a 10 foot that was stored at the existing facility. The 10ft lift was transported to Armkor’s facility where is was stripped down. The Hydraulic rams were stripped down, with the Rod’s being rehoned and new seals fitted. All the bushes were checked for any excessive wear. All bearings were checked and replaced where required. The scissor arms, and frame and impact barrier were stripped down. An undercoat of lead oxide was applied with two top coats of paint applied. A new holder was fabricated and installed on the lift to hold the new control dongle. Once the lift has been installed a new chain mail curtain was attached to the front lift to prevent access and debris being blown into the area of the frame. Fencing was installed to prevent access to unauthorised personnel. Armkor were asked to provide a solution to ensure that Aviation Security regulations were adhered to by creating a sterile security area created on the loading dock. After a site visit and discussions with the client various options were presented to the client for consideration. The solution the client chose was to have the front of the loading dock fenced along the front with individual gates for each door on the dock. The fencing was manufactured at Armkor’s facility and installed by our personnel. There was a requirement for barriers to prevent damage to the installed Caster Decking. 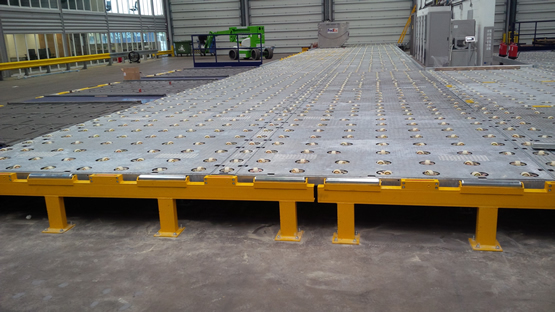 Armkor manufactured and installed barriers with GRC rollers on the top to aid the transfer of aircraft pallets and bins from the transfer dollies onto the Caster Decking. 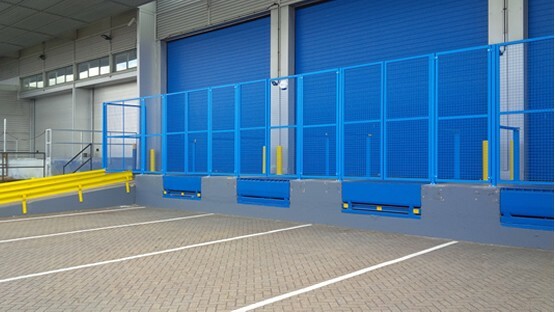 Bollards were also manufactured and installed at various points within the facility to protect different elements of the installed equipment to prevent damage whilst tugs, dollies and forklift trucks move around the facility. There was a requirement for a new Dock Leveller. On this occasion the pit where the Dock Leveller was to be sited had not been originally designed for this type of equipment. 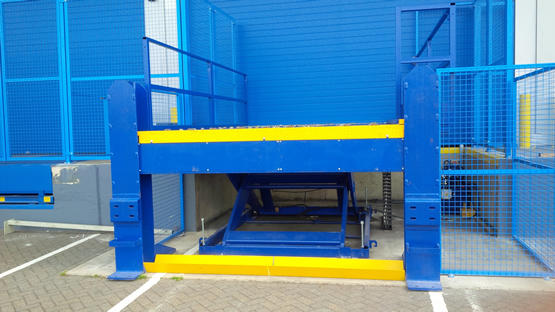 Armkor designed and fabricated a frame so that the Dock Leveller could positioned centrally within the pit. Durbar infill panels were placed either side of the Dock Leveller to fill in the gaps left. The frame gave the infill panels the required level of support should a Forklift Truck stray from the Dock Leveller.